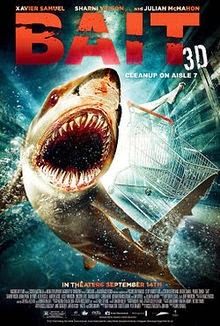 Bait (2012) is an absolutely absurd horror movie about sharks, and yet, it is also joyously absurd. Lensed in 3-D, the film is, alas, a wash visually. The director, Kimball Rendall, stages some truly dynamic shots here. He often comes up with great, scary (and funny) compositions. But he is undone in his efforts by weak special effects at points. To put this another way: sometimes the sharks look real, and sometimes they look like bad CGI. There’s no consistency whatsoever. I was amazed how well some shots hold up to real scrutiny. And shocked that other shots could be tagged instantly as phony as hell. In terms of narrative structure -- Bait, somewhat like Jaws 3-D (1983) -- attempts a blend of disaster movie tropes with Jaws franchise ones. 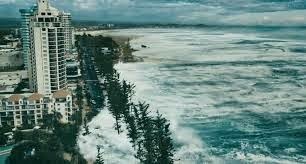 The great Russell Mulcahy contributes a script with co-writer, John Kim, and the film is set on the coast of Australia when a devastating tsunami hits. The tsunami floods several coastal blocks, and brings with it a handful of hungry great white sharks and other sea life. 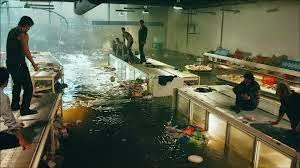 A group of people -- including two robbers, a life-guard, a police officer and his daughter --are trapped inside a grocery store, Oceania Food Mart, when the tidal wave hits. Before long, the terrified survivors are climbing to the top of the aisles, while the sharks prowl the same aisles, just feet below them. In short order, the sharks have realized they like the taste of live human beings, and won’t settle for the mart’s meat, stored in the freezer. The diverse nature of the random survivors makes for interpersonal frisson, and our lead character -- the young life-guard, Josh (Xavier Samuel) -- is recovering from an earlier tragedy involving his best friend and a great white shark. 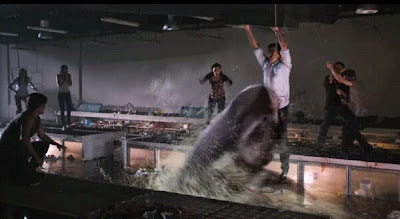 As you might guess, he must finally put the past behind him, and battle the sharks for the sakes not only of the trapped shoppers, but his ex-fiance, Tina (Sharni Vinson), who also happened to be shopping at Oceania when the crisis started. Periodically, Bait also cuts to the submerged parking deck below the mart, where two entitled rich kids (and their dog) are trapped in a car, and heroic stock-boy, Ryan (Alex Russell of Chronicle ) attempts to rescue them. The scenes involving the dog and the great white shark manage to build up quite a bit of suspense, at least if you’re an animal lover. The film also feature some good jump scares. At one point, Oceania’s obnoxious and loud-mouthed manager attempts to climb out of the store. He is hoisted up by a rope over a low-hanging vent pipe. He removes the grill, and is set to climb in and escape from the danger. Instead, he is confronted with another aquatic life-form…right at face level. For me, this was actually the most effective and disgusting scare in the film. 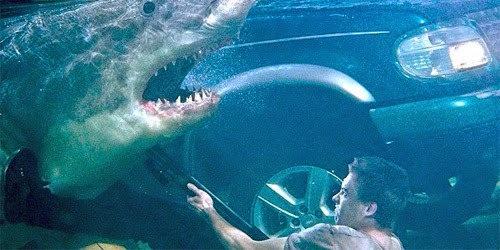 The one thing that periodically deflects suspense and terror -- and sends Bait into Sharknado territory -- is a focus on action movie tropes, particularly larger-than-life heroics. At one point, Josh takes a rifle in hand, and -- like John McClane in Die Hard (1987) -- goes underwater to battle a great white shark. As he does so, he dives into the water brandishing the gun in perfect athletic form. Another scene is equally far-fetched in terms of staging, involving the capture of a great white by meat hook. 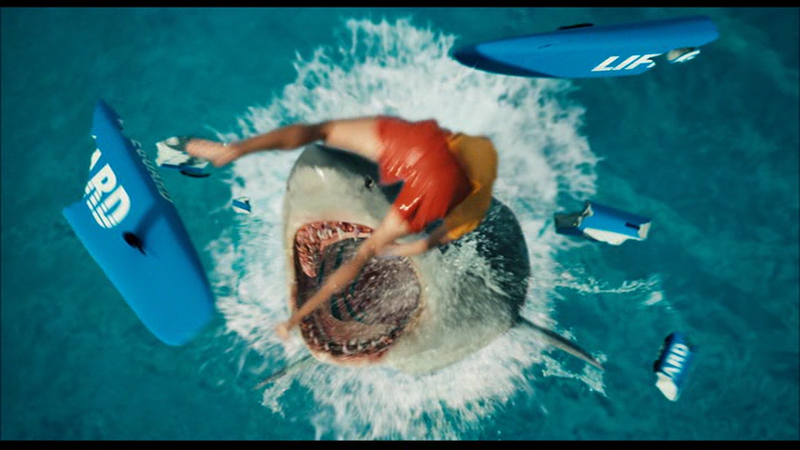 Finally, in the film’s most absurd sequence, a shark is tasered by Josh. Again, this act requires Josh to perform as the equivalent of a gymnast. These moments are good fun, and incredibly silly, but they effectively put Bait in another genre all-together from Jaws. This isn’t a scary, intense shark movie grounded in reality. It’s a roller-coaster ride instead, as eager to garner a laugh as a scream. Certainly, I can get into that approach, and I had a lot of fun with Bait. It may enter the so-bad-it’s-good category, but however you parse it, Bait ceaselessly entertains. Director Kendall, assisted by a knowing script, keeps three or four plot-lines going at once, and provides some key surprises that involve human nature. At one point, a shopper dons a make-shift cage suit and goes underwater to turn off the store’s power. This scene is so powerful because of the risks the character takes, and the fate he ultimately meets. It’s not what you expect, but it goes a long way towards exploring the different ways that various individuals respond to a crisis. For every heroic character, like this one, however, there’s another -- like the “secret” robber lodged within the group -- who is the exact opposite. Kendall makes the most of moments involving these life-and-death choices, and there are times in Bait when you will absolutely be on the edge of your seat. Goofy as could be, but oddly charming, Bait is no critic’s idea of a great movie, or a horror classic for that matter. But for a night of terror and laughs – cheap thrills, I guess -- it can’t be beat. 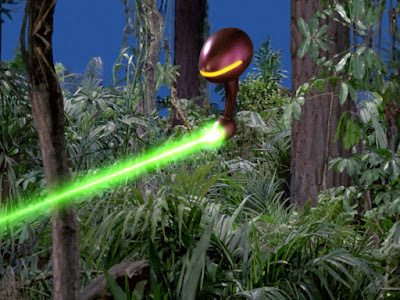 I almost never use the word “cheesy” -- I just don’t like to describe movies with that word -- but this movie is legitimately and knowingly cheesy. My wife is terrified of sharks and couldn’t stand to be in the room with me while I watched The Reef (2010). However, she emerged from Bait totally unscathed, if that helps you decide whether or not to screen the film.